Tavola pizzas come in an amazing variety, including Beach BBQ, Buffalo Soldier, Old School Supreme, Old Country, Pipeline and loads more. Using a list on the menu, guests can also craft their own pizza. Rob Clark has something unique in Tavola Pizza — his secret pizza recipe from the parents of his childhood friends in Syracuse, New York. And, his restaurant features an unusual decor for a pizza place. It has a surfing theme. Tavola features an unusual decor for a pizza place. It has a surfing theme. Tavola, pronounced TA-vola, means table, but it also means board. And Clark, an avid surfer and runner, decided his restaurant should feature a surfing theme. The pizzas come in an amazing variety, including Beach BBQ, Buffalo Soldier, Old School Supreme, Old Country, Pipeline and loads more. Using a list on the menu, guests can also craft their own pizza. The restaurant also offers salads, hot grinders, appetizers, house-made wraps and a children’s menu for youngsters age 10 and under. Guests can dine in or order take-out with free delivery. “We work very hard and we are very passionate about what we do, so this award means a lot to us,” Clark says. 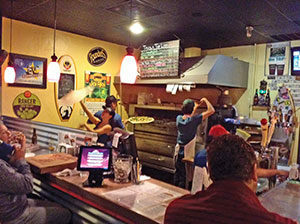 "Tavola Pizza has a welcoming environment and excellent service. They offer a good variety, specialty pizzas with plenty of sauce bases and toppings to customize your own. As a beer lover, it is wonderful to have an ever-changing selection of craft beers available to choose from." "Unique flavors that work well together and everything is fresh."